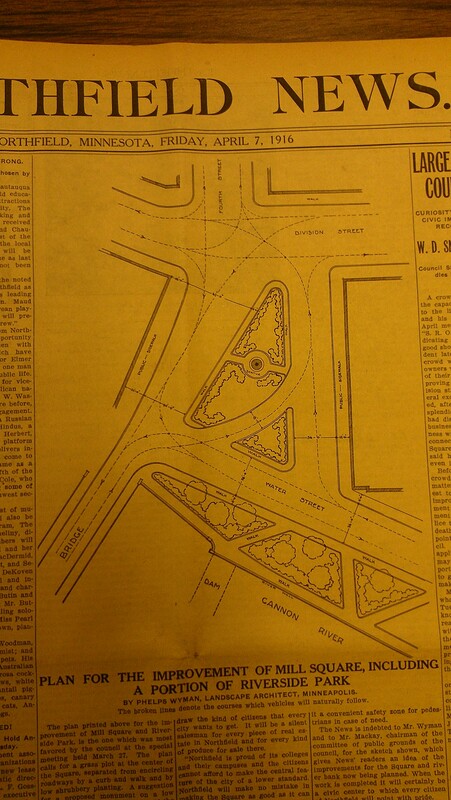 …well, the winning idea back in 1916, back when it was still called Mill Square…its original name back when it was platted by Northfield founder John North. It’s just one of a number of design concepts that will be remembered and/or reviewed (including one for a skyscraper apartment building in Bridge Square with a skyway to a riverfront commercial building…no kidding, they actually built a model of the concept) at next week’s Public Open House. It’s the second in a series of three open houses, considering possible design changes to Northfield historic Bridge Square, Monday, December 9th, 5:30 to 7:30 p.m., in the Riverview Conference Room of the Archer House River Inn, 212 Divison Street. As you can see, it’ll be a stimulating couple of hours. For more information, go to the project website, Concepts for a Future Bridge Square.